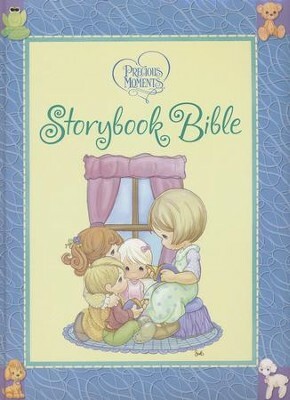 Engage children with this Bible storybook that features whimsical and nostalgic Precious Moments characters that will delight little hearts in full color illustrations. 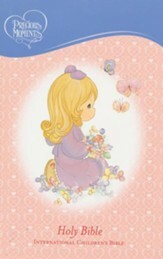 The Bible stories have been adapted from the International Children's Bible, and the text is large and readable, ensuring young ones' understanding of God's word. Also included are children's song lyrics, prayers, and a presentation page that features a family tree. Recommended for ages 4-7. 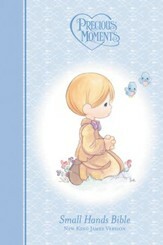 Inthis special Bible storybook, beloved Bible stories are combined with the endearing artof Sam Butcher's Precious Moments® characters. Every story is illustrated withfull color borders that playfully decorate the page along with large images tohelp bring the Bible story to life for your child. Their interest will stay onthe page as you read the delightful paraphrased stories from the International Children's Bible®while they areentertained by the art that has engaged millions of children around theworld. The text is a large and very readable 14-point size. . . greatfor beginningreaders! 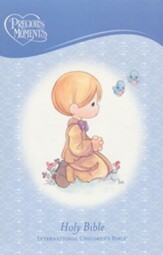 Also included will be a section for children's songs, specialprayers, and a presentationsection with family tree, etc. 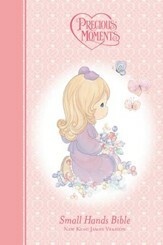 I'm the author/artist and I want to review Precious Moments Storybook Bible.